Mutton Rara is a unique mutton recipe as it combines the mutton pieces along with the minced mutton or keema. It originated in Dhaba - a road-side food stall in north India and Pakistan to serve food to travellers. It is prepared in a thick gravy in which minced mutton add more flavor to it. Spiced with fresh garam masala in a onion and tomato gravy is a delish dish of mughlai food lovers. To prepare this recipe, firstly, clean and wash the mutton pieces and keep it in bowl. Now, clean and wash the minced mutton and keep it in a separate bowl. Heat nonstick pan over low flame, when it is sufficiently hot add Cinnamon stick, green cardamom, black pepper and cloves. Fry them tossing it three to four times until nice aroma releases. Transfer the mixture from griddle to plate to cool down. When the spices are sufficiently cooled down. Transfer roasted spices into a hollow and grind it too into coarse powder and keep it in a plate. Add a pinch of nutmeg powder in the grinded garam masala mix well and keep aside, we will use it in mutton rara preparation later. Preparation of brown onion is a very important step for preparing mutton rara. In mutton rara recipe the mutton gets fried for approximately 40 minutes. Thus if we start the recipe with frying onion first and continue to cook onions till the end of recipe, the onions will get burnt and the taste of the recipe will get bitter. Slice the onions into long fine pieces. Pour half cup refined oil and half cup mustard oil in a heavy bottom pan and put it on medium flame. When the oil starts to smoke add the chopped onions. Fry the onions stirring occasionally till they turn golden in color. As soon as onions turn golden drain the onions from oil and keep it in a bowl. We will use it later in our recipes. Now add mutton and fry stirring continuously for 5 minutes on high flame. so that the mutton gets disarrayed and doesn’t gets stick at the bottom. Frying mutton on high flame helps in retaining juices and moisture in mutton retained in itself. After 5 minutes of frying the mutton add the mutton mince to it and again fry for 5 minutes stirring continuously. Now add 1 teaspoon garlic and 1 teaspoon ginger paste mix well and remember to keep the flame still on high. Now mix the previously prepared brown onion to it along with previously prepared fresh grounded garam masala. Again mix well and fry for 3-4 minutes. 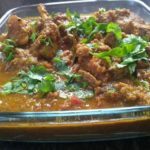 This recipe has lots of frying at regular intervals, and this is a must to make this dish really delicious - because of this reason we add brown onion and garam masala at this stage so that, the spices and onions do not get burnt. Now add fine chopped tomato again mix well and cook for another 5 minutes. Now add red chili powder and coriander powder and again sauté this for 5 minutes more. We need to sauté this till the tomatoes become soft. Mix a cup of curd to it and again sauté this for 10 minutes. To this add salt as per your taste mix well and add a cup of water again mix well. Now cover and pressure cook it till 10 minutes (3-4 whistles) on medium flame. Switch off the stove and let the pressure release. When the pressure gets released dish out the mutton in a bowl and garnish with chopped green coriander and ginger juliennes. Serve with Naan, Tandoori Roti, Phulka or Shirmal.